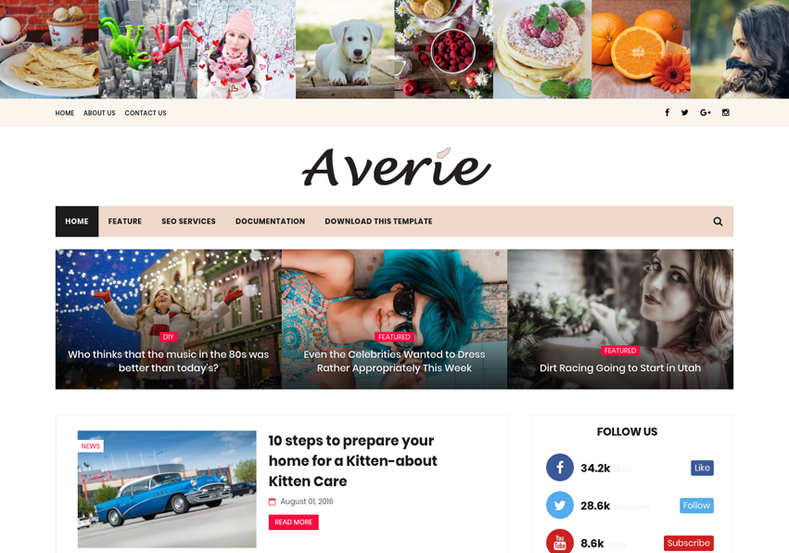 Averie Minimal Blogger Template is a stylish semi magazine blogspot theme with hero header, where it has instagram and featured widget. This template is suitable for Personal Bloggers, Magazine, Shop websites. But also can be used for girly blogs, flower shop, decoration, makeup, handcrafted items, travel etc. It is a perfect responsive and gorgeous SEO friendly and SEO optimized Blogger Template. Being a responsive theme it looks perfect on every screen, whether its a desktop, laptop or mobile. Since its a theme with minimalist appearance and clean features, it becomes most perfect option for the bloggers who likes to publish content nothing else, for that it has several widgets related to content and typography. This theme comes with simple color combination of black and white with pink as action color. Simple, Fast Loading, Responsive, Seo Ready, Adapted From WordPress, Ads Ready, Retina Ready, Breadcrumb Navigation Ready, Drop Down Menu, Social Bookmark Ready, Page Navigation Menu, Post Thumbnails, Clean, Browser Compatibility, Red, 2 Columns, Elegant, Black, Minimalist, Stylish, WhatsApp Sharing, Free Premium, Slideshow, 3 Columns Footer, Instagram Ready, Email Subscription Widget Ready, Fashion, Girly.